This device supports microSD (TransFlash) memory cards. A memory card is not included with the device. MicroSD cards can be purchased from any Verizon Wireless retail store or at the online store. 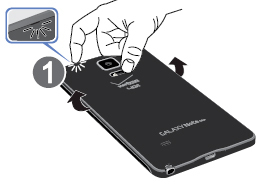 From the back of the device, locate the notch on the upper left edge then gently pull the battery cover off..